Exel Composites reports that its carbon fiber components have successfully completed nine years of service at CERN's Large Hadron Collider (LHC) particle accelerator in Geneva. As a part of the particle tracker support structures for the LHC's Compact Muon Solenoid (CMS) detector, Exel's pultruded profiles had to satisfy strict dimensional tolerances in an extremely challenging environment. The LHC is the world’s largest and most powerful particle accelerator. It consists of a 27 km ring of superconducting magnets with a number of accelerating structures to boost the energy of the particles along the way. Inside the accelerator, two high-energy proton beams travel at close to the speed of light, in opposite directions, before they are made to collide at four locations around its ring. 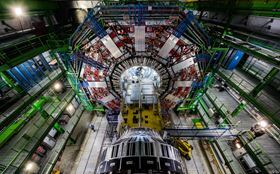 The CMS detector sits at one of the four collision points and records the paths taken by particles using a silicon tracker consisting of around 75 million individual electronic sensor channels arranged in 12 concentric layers. The tracker needs to record particle paths with very high precision yet be lightweight in order to disturb the particles as little as possible, the company says. Exel’s components are part of the 688 structures supporting the silicon tracker modules. These are made up of two 1.2 m long Exel carbon fiber epoxy composite U-profiles of 0.7 mm wall thickness and L-shaped cross-bars to form a frame structure on which the particle detecting modules sit. In addition to delivering the lightweight and radiation transparency required for this application, it was critical that the Exel profiles met extremely tight tolerances in terms of dimensions and straightness and maintained all mechanical properties at the low temperatures encountered in the CMS. In order to provide the high levels of stiffness and thermal stability required Exel designed the profiles using high modulus unidirectional (UD) carbon fiber. A thin glass fiber surface tissue was also employed to facilitate processing. All of the components and fixtures were then assembled and bonded on jigs at the Helsinki Institute of Physics to create structures with a dimensional tolerance of ± 0.05 mm. This story is reprinted from material from Exel, with editorial changes made by Materials Today. The views expressed in this article do not necessarily represent those of Elsevier.